Pantone – the foremost authority on color has proclaimed Honeysuckle pink as its “2011 Color of the Year”. 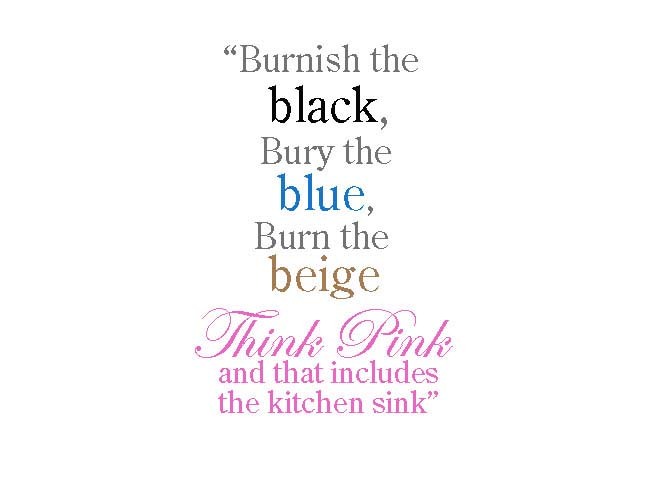 Pink is hot right now, we are seeing a whole rich spectrum of it – everywhere and more than just one hue. 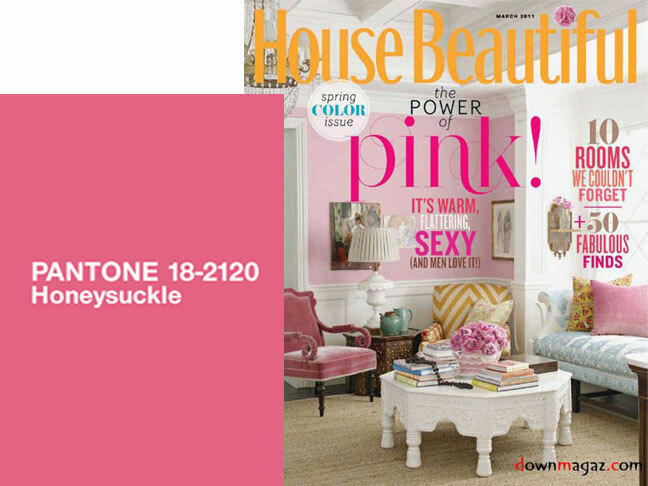 Look at the March issue of House Beautiful magazine and you will be enlightened to the power of pink when it comes to decorating our homes this year. Well, we don’t want to go that far – although marketers would love it if we did. Color trends come and go – while only last year Pantone told us turquoise was the way to go. It’s enough to drive even design lovers crazy. To keep your decor fresh without going crazy trying to keep on top of things – add only a few touches of it instead of going full board with a current trend. A pop of pink here and there -perhaps a pillow, a vase, a throw , or a small area rug. These pops of color will keep your home looking up to date without breaking your budget at the same time. 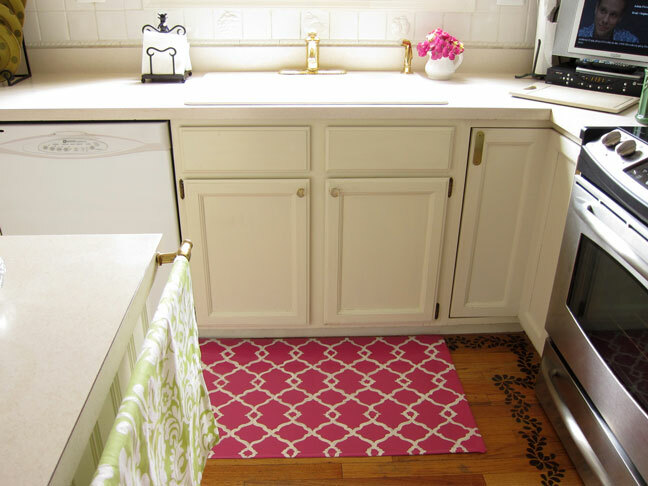 I have always wanted a rug in my kitchen to stand on when I am at the sink. I am never happy with the selection at most stores – they are not my style, too expensive, too small, not in my colors or a design I like. So I decided to make my own and am going to show you how I did it very inexpensively. Its pink with a hip design, plus it can be wiped clean. 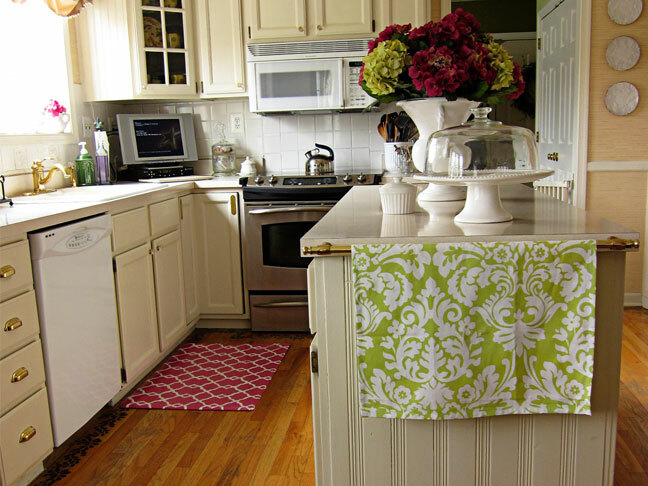 I’m loving it – I made it to my exact specifications – a custom rug for under $20. 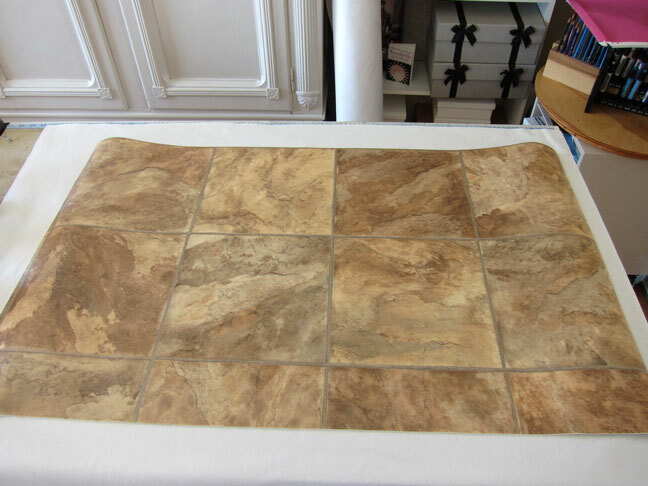 Scrap piece of vinyl flooring – if you don’t have a scrap piece lying around your home from a room re-do you can buy a remnant inexpensively at your local flooring store. There are different types – fiber backed and felt backed. The fiber back has more cushion and is the type I used here. 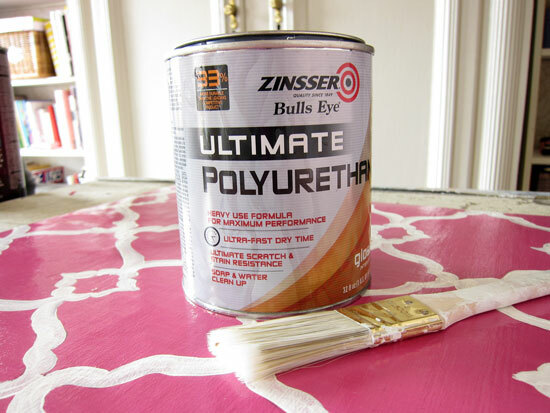 Zinsser Ultimate Polyurethane – I used Gloss finish. This is a water based formula and will not yellow. your rug. 1. 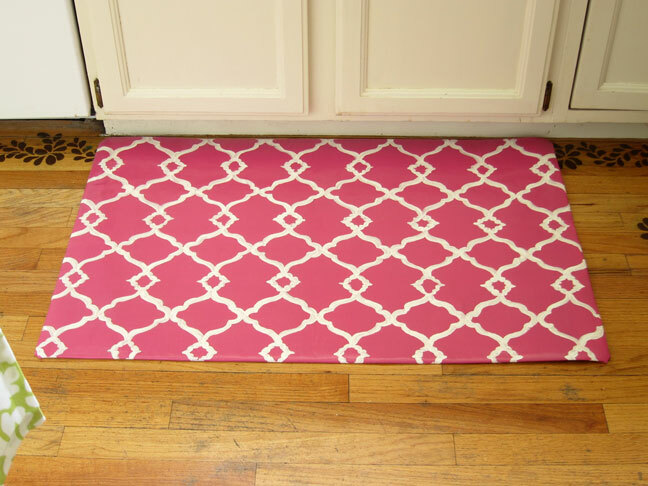 Cut vinyl to the rug size desired using a straight edge and mat knife. 2. 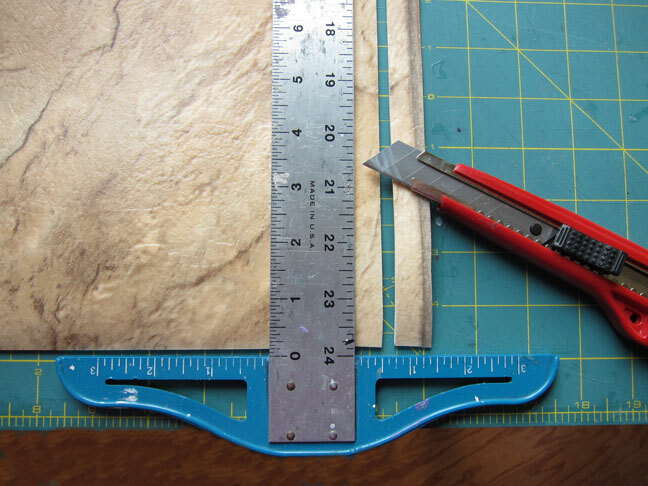 Measure your fabric so that it is 4-inches larger on all sides of the cut vinyl. You will need the extra to wrap around to the underside of the vinyl. 3. Brush on 2 coats of Gesso onto fabric. Let dry between each coat. 4. Print out Pdf of the design Here. Take it to a copy machine and enlarge 200% or to a desired size. 5. 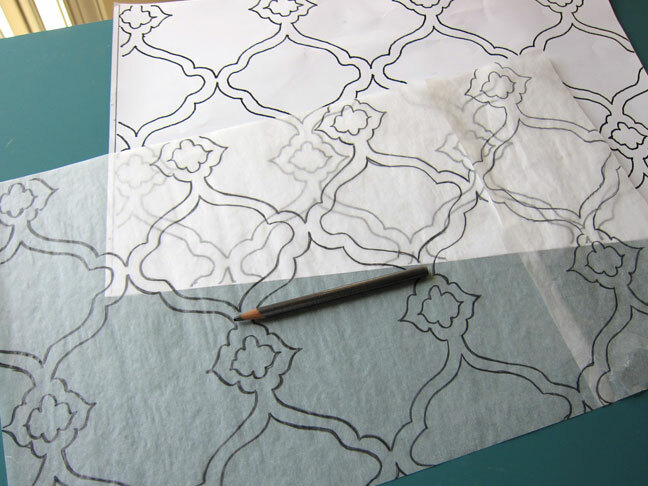 Using tracing paper, trace the design using a soft lead pencil. A soft lead will transfer to the cloth much easier than a #2 pencil. 6. When Gesso is dry on fabric. 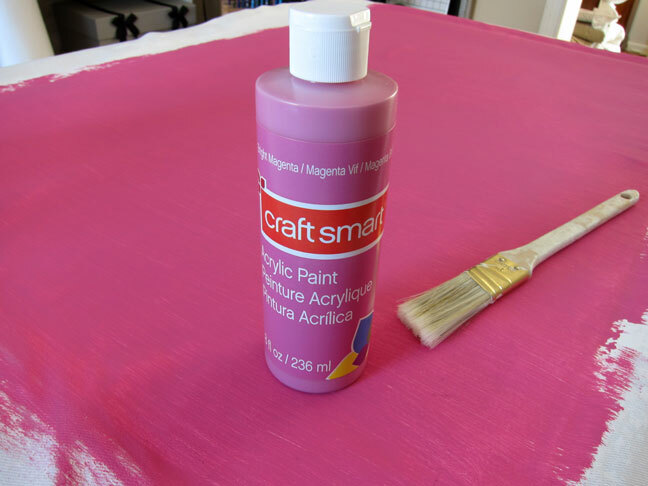 Paint 2 – 3 coats of pink paint on fabric, let dry between each coat. 7. 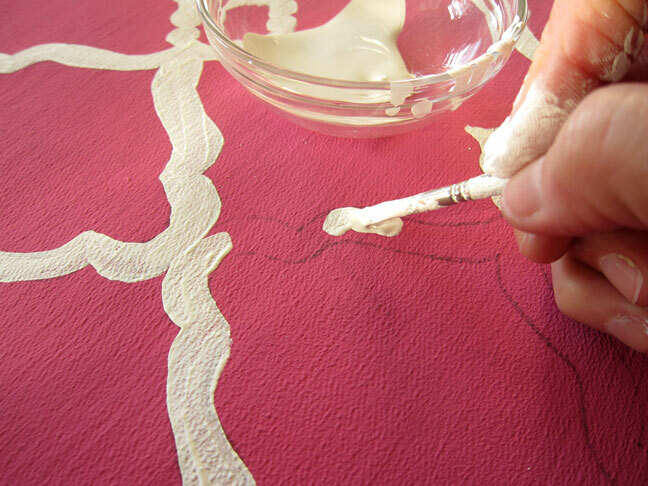 When paint is dry – place the pencil traced side of the tracing paper down on one corner of fabric. Make sure pencil side is down. Once you have the design lined straight in the corner, begin to draw over the design again, but on the reverse side of the tracing paper using hard pressure. This will transfer the pencil lines to the fabric. 8. Once you have the first section done move the design above the section just completed. Match up the design and repeat the process of going over all the lines with a pencil. 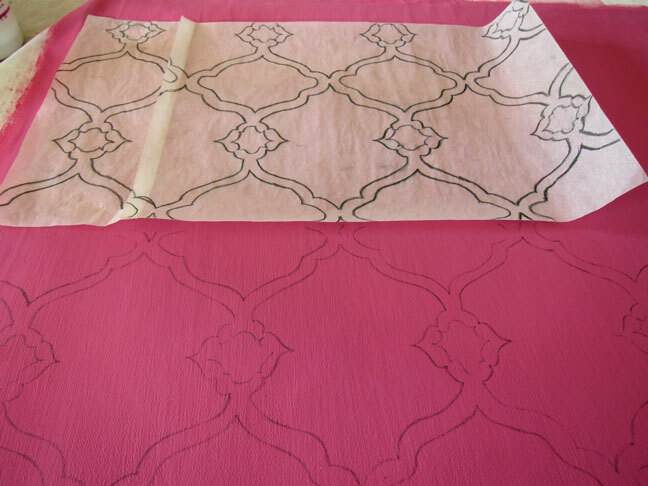 Keep moving design and matching it up over fabric until the fabric is covered with the design. 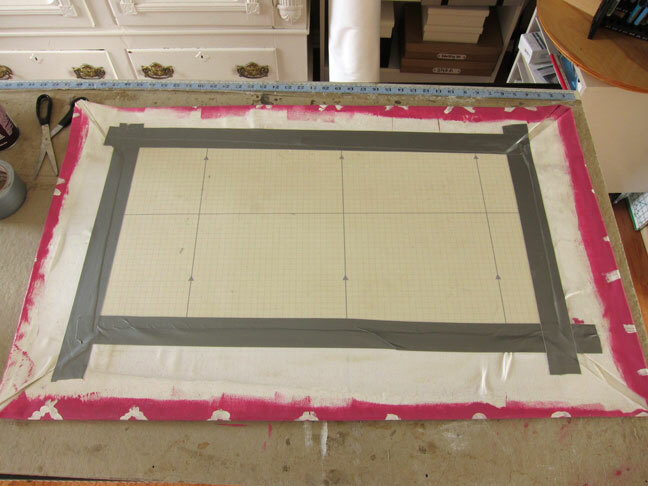 If you are working on a large piece and using the same design – you may have to go over the design on the underside of the tracing paper to build up the graphite so there is enough to keep transferring the design. 9. 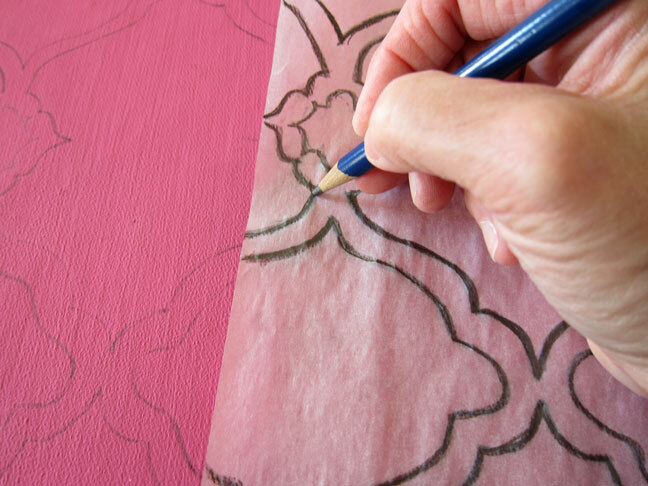 Using a small ¼ flat artist brush – paint the design using white craft paint. Let dry. 10. Once dry, flip the fabric over and then place your cut vinyl on top. Make sure your design is evenly placed and runs straight on all sides. Starting on one end spray the spray glue on the back side of fabric and right side of vinyl. Let the glue get tacky then press to adhere the two. Once you are sure the design will run straight along the edge of the vinyl -then spray the rest of the back of fabric and right side of vinyl. 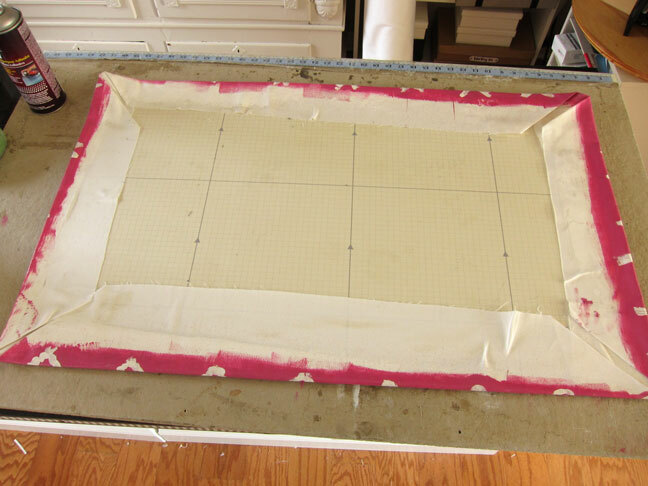 Turn over and use your hands to press out any air bubbles out to each side making sure fabric is adhering to vinyl. 11. Flip rug back so underside is up. Starting in one corner use spray glue to adhere the excess fabric to the underside of rug as shown. 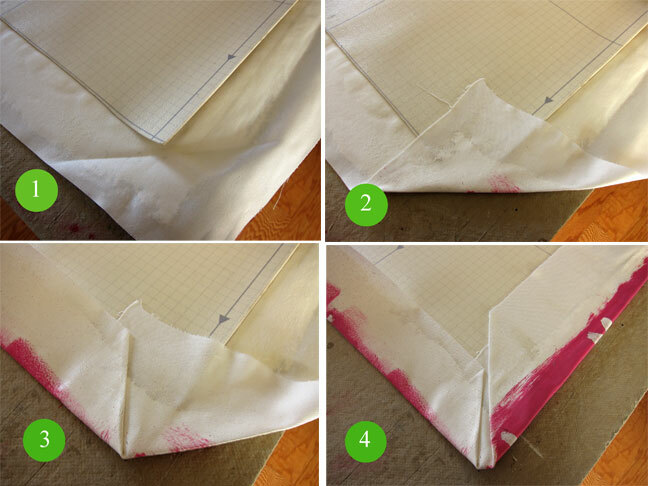 Spray the glue on before each step to make sure the folds stay flat and adhere. 12. 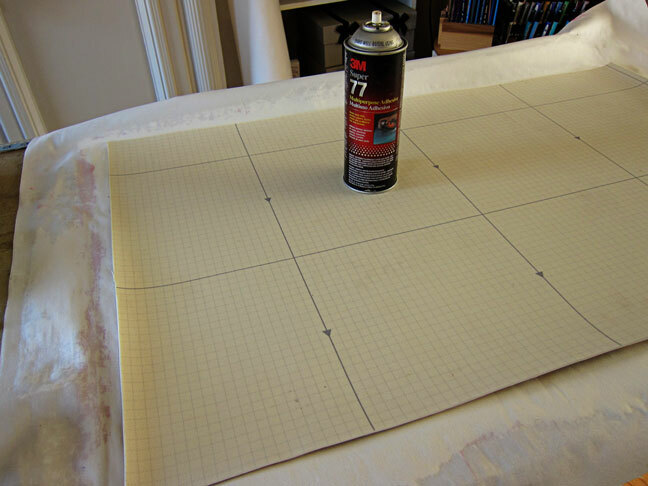 Pull the sides around taut and spray glue them onto the vinyl – then continue to the next corner and side until all the excess fabric is glued to the underside of rug. 13. I like to add good old fashioned duct tape all around the underside to make sure the fabric stays adhered. It is inexpensive and heavy duty. 14. Flip the rug over and apply one coat of polyurethane over all the painted area on the rug. Make sure to get poly on the outer edges of the rug also. Let dry thoroughly and then add at least 3 more coats. Let each coat dry before applying the next and make sure to apply light coats – not thick. You want to build the polyurethane finish so that the fabric will be wipe able. 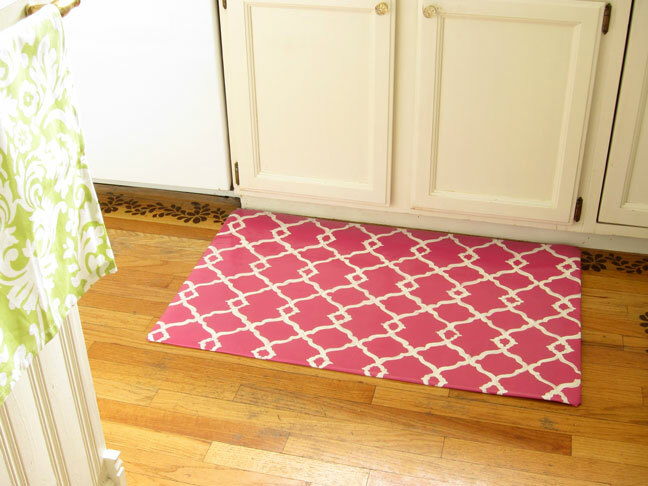 Don’t skimp on this step as you want your rug be wipe able so it stays clean. 15. Once your last coat of poly is dry your rug will be ready to use. So next year when pink is “so last year” you will know what to do to update your decor – tweaks and color pops to whatever the “IN” color may be.